Internal Flights: 1961, 13 Mar. / 1961, 27 Mar. / 1961, 27 Mar. Of the Inauguration of the Tasman Empire Airways flying boat trans-Tasman service by Short S.30 ZK-AMA "Aotearoa". Several different types of souvenir covers were produced and a pictorial datestamp was used by the Auckland Chief Post Office to cancel mail. QANTAS Lockheed L188 Electra service inaugurated by VH-ECC "Pacific Endeavour" (Captain JS. Ross) on 3 October. The return Wellington-Sydney flight was made on the following day. Special QANTAS covers were flown and were backstamped Wellington 3 Oct. and Sydney 4 Oct. respectively. QANTAS Lockheed L188 Electra service inaugurated by VH-ECC "Pacific Endeavour" (Captain JS. Ross). Special QANTAS covers were postmarked at Sydney on the 3rd were backstamped in Auckland on the 4th. The return flight was made on 5 October and covers were backstamped the same day at Sydney. QANTAS Lockheed Electra service commenced by VH-ECB "Pacific Explorer" (Captain A.L Gay). QANTAS covers were included in the mail and were backstamped 4 October. The return flight was also made the same day. QANTAS Lockheed Electra service inaugurated by VH-ECC "Pacific Endeavour" (Captain FS. Furniss) on 7 October. The return flight from Melbourne was made the next day. QANTAS Lockheed Electra service inaugurated by VH-ECB "Pacific Explorer". Internal Flight: 1961, 2 Dec. Flight to the Russian Antarctic Base at Mimy by Iluyshin 11-18 CCCP-75743 (A. Polyakov) and Antonov AN-12 CCCP-04366 (B. Ossipov). The aircraft carried a relief party and supplies for the base and an Australian Ministry of Defence observer on board the 11-18. Mail was flown from the USSR to Mimy together with six covers of Australian origin, but no mail is known from New Zealand. The two aircraft refuelled at Christchurch Airport and flew south on 24 Dec. 1961. They returned to Christchurch on 25 Jan. 1962 direct from Mimy and flew to Sydney the next day. Internal Flights: 1962, 23 May / 1962, 3 Nov. / 1962, 20 Dec.
Inaugural flight of British Overseas Airways Corp. service by De Havilland Comet 4 G-APDH. The Comet left London at 11.45am on 3 April and after flying the various stages, reached Whenuapai Airport at 3.46pm on the 4th. The return flight left Auckland at 8.40am on 6 April and arrived at London at 11.10am on the 7th. Flight Captains were: London-Damascus, Captain Rowe; Damascus-Karachi, Captain Creigh; Karachi-Singapore, Captain Parsons; Singapore-Sydney, Captain Chitty; Sydney-Auckland, Captain Alabaster; Auckland-Singapore, Captain Chitty; Singapore-Karachi, Captain Symmonds; Karachi-Beirut, Captain Nelson; Beirut-London, Captain Waterfield. Special BOAC covers were flown over the stages but covers scheduled to be posted at Darwin were not serviced. By Straits Air Freight Express (SAFE) Bristol Freighter ZK-CAM "Merchant Venturer" (Captain C.G. Fantham, Captain J.D. Howard), The aircraft was chartered by the N.Z. Railways Department to fly two helicopters to Australia and returned to New Zealand on 2 August. It was reported that mail was carried but this has not been verified. Internal Flights: 1963, 18 Sept. / 1963, 1 Oct.
Lockheed Electra service inaugurated by TEAL No official mail was carried on the inaugural flight from Wellington and mail from Brisbane on the return flight was not backstamped until 4 November. Internal Flight: 1963, 19 Dec.
By TEAL Lockheed Electra (Captain C. J. Le Couteur.) The French Government terminated TEAL's landing rights in Tahiti on 31 December, 1963 but allowed passengers who had been booked before that date to be carried on special flights, of which this was the final one. Captain C. J. Le Couteur was the pilot of the Short S.45 Solent ZK-AMO "Aparima" in 1951 when he carried out a proving flight to Papeete and return, between 28 November and 5 December. Internal Flights: 1964, 15 Feb. / 1964, 6 Mar. / 1964, 6 Mar. Weekly return service by QANTAS Douglas DC-4 from Australia and TEAL from Auckland. Weekly service by TEAL Lockheed Electra. No official mail was flown on the first flight from Auckland but mail was flown from Noumea on the return flight. By US Navy Lockheed LC-130F Hercules 148319 piloted by lieutenant R.V. Mayer. The LC-130F had flown from the USA to NZ to make the mid-winter flight to McMurdo Station, Antarctica to bring an injured Seabee back to Christchurch. The Hercules left Christchurch at 9.52am, reaching McMurdo at 8.25pm and after a two hour stopover, returned to Christchurch. Some mail was carried on these flights. Same day service commenced by QANTAS with Lockheed Electras. Internal Flight: 1965, 22 Mar. Before changing name to Air New Zealand on 1 April, 1965. The last two TEAL flights were Christchurch-Sydney on 30 March and the Pacific service on the 31st. First flights by Air New Zealand. Special covers postmarked AUCKLAND F.M.B.1 AP.65 were backstamped at Norfolk Is. on the same date. Covers from Norfolk Is dated 3 April were backstamped at Auckland on the 5th. Following the change from TEAL took place on the Pacific service. When a RNZAF Sunderland made a reconnaissance flight from Auckland to the Kermadec Islands the opportunity was taken to drop mail to the staff of the Meteorological station on Raoul Island. By QANTAS Boeing 707 V-Jet VH-EBL "City of Geelong" (Captain R.F. Uren), The Sydney-Christchurch service was flown 10 April and the return service on the 11th. QANTAS produced a souvenir cover and a special datestamp was used in Sydney (10 Apr. 65). The mail consisting of 3,210 pieces was backstamped CHRISTCHURCH 10 APR 652-PM. The return mail was postmarked in Christchurch at 11.00am. on the 11th. And was backstamped at Sydney at 9.00pm on the same day. Inauguration of Air New Zealand "Five Star Jet Service" by Douglas DC-8 ZK-NZB (Captain PJ. La Couteur). The DC-8 flew from Christchurch International Airport to Kingsford Smith Airport and returned the same day. Souvenir covers were issued by Air N.Z. and a special datestamp was used at Christchurch Chief Post Office. Internal Flights: 1965, 16 Oct. / 1965, 23 Oct.
First flight by Lockheed C-130H Hercules NZ7003 (Wing Commander B.A. Wood) of No 40 Squadron, RNZAF. Mails, personnel and stores for Scott Base were transported to Williams Field, McMurdo Sound. ROYALIST while the ship was lying disabled with engine trouble in mid-Pacific. A Sunderland of No. 5 Squadron RNZAF, Lauthala Bay, Fiji (Flight lieutenant T.E. Enright) flew to the ship and dropped mail before continuing to Tulagl in the Solomon Islands. It returned to Lauthala Bay after flying some 3,000 miles in all. A cover viewed was posted in Auckland, flown to Fiji on a commercial service and carried by Sunderland to the ship. It bears a rubber stamp cachet reading COMMANDING OFFICER -6 NOV 1965 -HMNZS ROYALIST and is endorsed in ink with the ship's position -10'40.1S 156'38.8E. ASHBURTON N.Z - 7-PM - 8 NOV 1965 DESTINATION SPECIAL BALLOON MAIL. Some postcards have a printed etiquette CAPTIVE FLIGHT but it uncertain how they were used. Pan American World Airways Jet service from Los Angeles via Honolulu-Pago Pago-Nandi-Auckland was commenced when Auckland International Airport was opened on 24 November. A large square cachet was applied by Pan Am to covers and a special datestamp was used at Auckland C.P.O. Internal Flight: 1965, 24 Nov.
QANTAS V-Jet service inaugurated by Boeing 707 VH-EBA "City of Melbourne" (Captain PA Probert). QANTAS souvenir covers were postmarked at Sydney on 24 November and backstamped at Auckland the same day. Covers for Sydney were also postmarked at Auckland on the 24th. Air New Zealand Douglas DC-8 ZK-NZB (Captain LW. Russell) introduced the "Five Star Jet" service, leaving Auckland International Airport for Nandi at 9.20pm where it arrived at 12.49am. The return flight (Captain R. Puttick) left Nandi at 5.20am on the 25th and reached Auckland at 8.lOam. Air NZ produced souvenir covers and a special datestamp was used at Auckland. Pan American Airways gained a mail contract from Tahiti so that when Auckland International Airport was opened Pan Am realigned the South Pacific "Clipper Jet service" to Sydney to include a stop at Auckland. Souvenir covers bearing cachets reading SYDNEY-AUCKLAND, AUCKLAND-SYDNEY and AUCKLAND-PAPEETE or PAPEETE-AUCKLAND were applied. Souvenir covers were provided by Pan Am on the first flight and a special postmark was struck at the Chief Post Office, Auckland on 25 November. Boeing 707 N408PA carried out its first service, piloted by Captain RE. Lawrence and Captain LE. Larsen (Papeete-Sydney) and Captain J.A. Mach and Captain F.T. Linart (Sydney-Papeete). British Overseas Airways Corporation (BOAC) first Boeing 707 Jet service London-Nandi. G-APFD left London Airport at 3.30pm on 24 November and reached Auckland on the 25th, flying via Zurich-Bombay-Singapore-Sydney. The aircraft flew to Nandi on the 26th and returned the following day, piloted by Captain McGregor. BOAC special covers were cancelled AUCKLAND 26 NOV 1965 and backstamped at Nandi the next day. Covers from Nandi were postmarked on 27 November. (Of the stages flown, only NZ-Fiji and Fiji-N.Z covers are listed here). Air New Zealand service commenced with Douglas DC-8 ZK-NZB, Captains J. Shorthouse and A.G. Vette on the outward flight and Captains R. Puttick and P.McA. Grundy on the homeward flight. The DC-8 left Auckland at 9.45pm on the 28th and, after crossing the International Date Line, left Nandi at 8.04 am the same date and arrived at Tafuna Airport, Pago Pago at 10.16am. The return flight left Pago Pago at 1.45pm on the 28th, Nandi at 5.02pm, and landed at Auckland International Airport at 7.56pm. Air NZ produced souvenir covers and a special datestamp was used at the Chief Post Office, Auckland with covers from Pago Pago stamped with a round Air New Zealand cachet and postmarked 28 November. Covers backstamped at Auckland on 29 November at 11.45am. Douglas DC-8 ZK-NZA (Captain P.F. La Couteur, Captain L Simpson) extended the Air NZ "Five Star Jet" service from Pago Pago to Los Angeles (see 28 November). The first scheduled flight on the 'Southern Cross Route' left Auckland at 11.40am on 14 December and, after crossing the International Date line, left Nandi at 3.22am, 13 December, Honolulu at 11.15am and arrived at Los Angeles at 7.54pm on 14 December. ZK-NZA (Captain R. Puttick and Captain LC. Patterson) returned to Auckland at 10.45pm on 16 December. Air NZ produced souvenir covers and a special datestamp was struck at the Chief Post Office, Auckland. A round cachet was also applied at Los Angeles and Honolulu. Internal Flights: 1966, 29 Jan. / 1966, 28 Feb. / 1966, 1 Mar. / 1966, 1 Mar. / 1966, 2 Mar. Air New Zealand 'Five Star Jet' service. Douglas DC-8 ZK-NZA (Captain P.L McFarland) left Auckland at 9.22am for Sydney where Captain P.F. La Couteur took over the flight from Sydney-Darwin-Hong Kong. The return flight left Kai Tak Airport, Hong Kong at 10.16pm on 4 March (Captain D.W.G. Keesing and Captain A.W. Jones) for Sydney from where Captain P.L McFarland piloted ZK-NZA to Auckland, arriving at 3.42pm on 5 March. Air NZ produced souvenir covers and a special postmark was used on 3 March at the Chief Post Office, Auckland. Covers from Hong Kong were dated 4 March and backstamped at Auckland on the same date. 2,666 covers were flown from Auckland to Hong Kong and 2141 from Sydney-Hong Kong. Boeing 707-338C VH-EBF "City of Alice Springs" (Captain L.I. McNeil) inaugurated the QANTAS trans-Pacific service Sydney-Auckland-Papeete-Acapulco-Mexico City. QANTAS issued souvenir covers and the Chief Post Office, Auckland provided a special datestamp which was struck on N.Z.-Mexico covers. A large cachet was applied to the back of covers at Mexico City and they were backstamped MEXICO CITY 28 MARCH Covers for the return flight were postmarked on the 29th and those addressed to Auckland were backstamped at 9.00am on 31 March. 1,749 covers were flown from Auckland. Air New Zealand Douglas DC-S ZK-NZA (Captain W.P.N. Clarke) left Auckland at 3.48pm and arrived at Brisbane at 3.04 pm (local time). The return flight left Brisbane at 6.00pm and landed at Auckland at 10.55pm. 830 covers were flown to Brisbane and 850 from Brisbane to Auckland. There were also 630 covers from New Zealand with return addresses which were flown both ways. Air New Zealand introduced its 'Five Star Jet' service from Auckland. The Douglas DC-8 ZK-NZA (Captain S.M. White, Captain B.J. Wyatt) left at 9.20am landing at Sydney at 10.30am and departed for Singapore at 12.32am where it arrived at 6.22pm. The return flight of ZK-NZA (Captain H.B. Thompson, Captain LW. Russell) left Singapore at 10.05pm, arrived at Sydney at 9.10am. 7 April and Auckland at 1.56pm Souvenir covers were produced by Air NZ and a special datestamp was used at the Chief Post Office, Auckland. Return covers were postmarked on 6 April at Singapore Airport, and were backstamped at Auckland on the 7th. A large circular special postmark was used at Sydney and return flight covers were backstamped there at 11 am. on the 7th. 2,193 covers from Auckland-Singapore, 1,582 plus 536 with return address flown Sydney-Singapore, 1,320 from Singapore-Sydney and 1807 from Singapore to Auckland. A trawler owner from Bluff, Mr G. Blaikie, chartered NZNAC Douglas DC-3 ZK-APA "Hokitika" to bring two crew members from his vessel in the Chatham Islands back to Christchurch. His offer to carry mail was accepted by the Post Office and 300lbs, including parcels, was flown from Christchurch. On the return flight only 30lbs of mail was carried. Inaugurated by Union de Transports Aeriens (UTA) as a sector of its Auckland-Papeete- Los Angeles service. A Douglas DC-S (Captain Fulschoer) carried 1,152 souvenir covers which had been cancelled at the Chief Post Office, Auckland with a special datestamp, to Papeete, where they received a commemorative backstamp. By Military Air Transport Service (MATS) of the United States Air Force (USAF). Lockheed C-141A Starlifter 65-229 completed the first flight by jet aircraft from New Zealand to Antarctica and back, in connection with Operation Deep Freeze. Union de Transports Aeriens (UTA) commenced its "WhisperJet" service when Sud Aviation Caravelle 10-BIR F-BHRA (Captain A. Pelletier) flew souvenir covers in both directions. UTA covers were postmarked NOUMEA 14 12 1966 but were not backstamped at Auckland. The 1,190 covers postmarked Auckland on 15 December were backstamped NOUMEA 17-H 15121966. Service to the Chatham Islands ceased after nine years when the flying boats were withdrawn from service. NZ4113 took off from the Te Whanga Lagoon at 12.45pm on 22 March on the final flight to Hobsonville. It is not known if mail was carried. Bristol Freighter NZ5907 of No. 3 Battlefield Support Squadron, RNZAF, at the request of the Department of Internal Affairs, flew from Wellington to Hapupu airstrip with 18 passengers and mail. Administration of the Islands had been transferred to the Department Internal Affairs. A sector of Air New Zealand's "Five Star Jet" service to Los Angeles. Douglas DC-8 ZK-NZC (Captain F.W. Kilgour, Captain J.F. Harrison) left Auckland at midnight on 5 November and arrived at Papeete on the same date after crossing the International Date Line. The aircraft left Papeete and landed at Los Angeles, still on 5 November. The return flight left Los Angeles at 8.22am on the 10th, Papeete on the 11th., and reached Auckland at 7.45pm on the 12th. after again crossing the International Date Line. Covers including Air NZ souvenir envelopes totalling 2,535 were flown from Auckland. Mail was backstamped at each point. Internal Flights: 1968, 8 Jan. / 1968, 7-14 Oct. / 1968, 14-15 Oct. / 1969, 25-28 Oct. / 1968, 19 Dec. / 1968, 20 Dec.
Service commenced by Tasman Air Services Ltd Piper PA-31 Navajo ZK-CUP (Captain L Reardon), Passengers and letter mail only were carried. The Department of Internal Affairs chartered Tasman Air Services Ltd Piper Navajo ZK-CUP for a special flight. Internal Flights: 1969, 9 Oct. / 1969, 2 Dec.
By SAFE Air Ltd. Bristol 170 Freighter ZK-CLT "Merchant Hauler" (Captain C.G. Fantham) with passengers and mail. This was the first SAFE commercial flight Chathams-Christchurch. Mail for the Chathams weighed 40lbs. By SAFE Air Ltd Bristol Freighter ZK-CLT "Merchant Hauler" (Captain J.D. Howard, First Officer J. Faircloth). This was the first scheduled flight of the SAFE Air service from Christchurch. Mail flown to the Chathams weighed 228lbs. Internal Flights: 1969, 16 Dec. / 1970, 6 Jan.
Commenced by Douglas DC-8 of Air New Zealand. No official mail was carried on the first flight from Auckland-Melbourne on 5 July, but on the return flight Douglas DC-8 ZK-NZE (Captain LH. Gemmell) carried mail weighing a total of 26.6kg. ZK-NZE worked the Christchurch-Melbourne service on 7 July. American Airlines inaugurated a South Pacific Service. Boeing 707-323B N8437 made the first flight carrying mail on which two cachets were struck, one showing Auckland and the other Sydney as terminals. Covers have been reported incorrectly cacheted. A special datestamp was used on outward mail at the Chief Post Office, Auckland. Many different covers and connections were flown but the list below shows only the basic New York-Auckland and return sectors including quantities flown and cachet colours. Internal Flight: 1970, 25-28 Aug.
First official mail flight by Air New Zealand Douglas DC-8. (See 5-7 July). 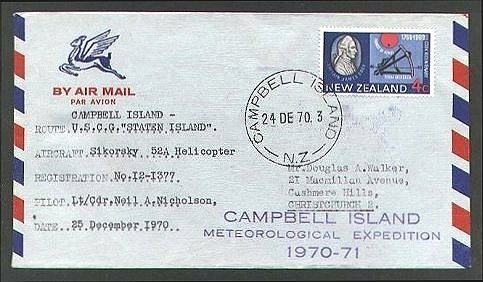 Internal Flights: 1970, 19 Oct. / 1970, 31 Oct. / 1970, 2 Nov.
Sub-Antarctic Meteorological Base Helicopter mail. When the US. Coastguard Cutter "Staten Island" called at Campbell Island on its way to the Antarctic, its Sikorsky HH-52A helicopter #1377 (coded 12) flown by lieutenant Commander Neil A. Nicholson took mail from N.Z. to the island base. Some covers were backstamped 25 DE 70 and had the base rubber-stamp cachet. Outward mail was flown from the base to the ship and later taken to N.Z. These covers bear December datestamps up to the 24th and some were struck with the base cachet.